Stories of strange black dogs abound in Britain forming a distinctive part of the country’s folklore. These dogs are not conventional canines by any means but have something mysterious about them – something supernatural. They are often described as being particularly large, and having red glowing eyes. Stories of encounters with mysterious black dogs have been told as far back as the 12th century, contains one early account. Folklorists have identified a number of different names applied to the black dogs in the different regions of Britain. In Lancashire, the name “Guytrash” or “Skriker” is used, while in Yorkshire they are known as “Barguests.” In Norfolk and East Anglia the word “shuck” or “shock” is used to describe them, derived from the old English word for demon. Some believe the black dogs are bad omens: that they foretell the death of the witness, or a death in the witness’s family will be imminent. In most cases the black dogs do very little after they appear. 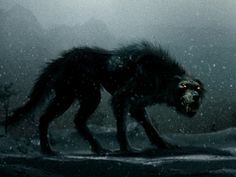 They may vanish or run off, or on occasions some witnesses claim that they have been growled at. There are cases where the black dogs are reported to have attacked and killed people, however. In Bungay, Suffolk, in the year 1577, a mysterious black dog is said to have attacked and killed two people who were attending a church service. Even today, the weathervane in Bungay market depicts a devilish-looking black dog in commemoration of this event. The church still exists and on its door are strange marks which some say were left by the dog as it fled. Black dogs often seem to be associated with particular places. They are often spotted on roads and at crossroads. Some have speculated that the black dogs patrol ley lines, which are said to be mysterious channels of hidden energy within the earth. Even in Rotherham, we have our very own story of a black dog at Anston Stones that has appeared on a number of occasions. Black dog stories represent a very curious side of the paranormal. Although black dogs have occasionally been spotted in other countries, the prevalence of the stories appears to be unique to Britain. There has never been a convincing explanation of where black dogs come from or what they represent. It remains a mystery.